NBC: Stop Elephant Exploitation on NBC and Worldwide! This petition has been created by Jeanie P. and may not represent the views of the Avaaz community. On Wednesday, June 18, 2014, Jimmy Fallon, host of NBC's The Tonight Show, amazed us all by bringing out on stage and before the cameras an 11,000 pound elephant as part of his segment on wildlife. 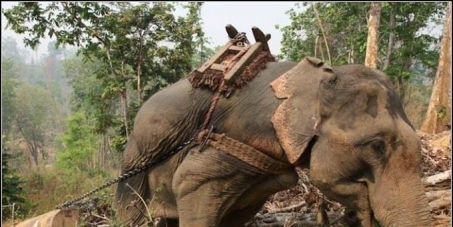 The elephant was accompanied by a woman handler who stood closely by and with both of her arms behind her back as if hiding something; perhaps a bullhook which is a metal torture and punishment device to control elephant behavior. The other person was, I assume, her trainer who had this elephant do 'tricks', such as eating an apple, eating bananas fed to her by Jimmy Fallon and to rest her foot on a watermelon without crushing it. Her last 'trick' was to pick up Jimmy Fallon with her trunk. With that done, the audience laughed and applauded - and that was all there was for the studio and television audiences, but tragically not for the elephant. This NBC segment was straight from the books written by Ringling Brother's, Shriner's, etc. I felt like I had been to a circus where animals 'perform' in fear of severe reprisal by the handlers and trainers. This elephant was no different. She moved, but only on command. Any animation would tell you nothing about being an elephant, but rather a slave living in a stark reality of abuse, deprivation and anguish. Were there viewers who recognized her ordeals, who saw that something was missing about her spirit? I saw her majesty and pride and nobility clouded over by years of forced transformation. And so, the studio audience went home and the television viewers tuned off, many of them unknowing, having not been taught, what a marvelous, creative, highly intelligent creature that an elephant really is. I call upon NBC to completely and permanently vacate use of elephants as a form of entertainment in future network and affiliate programming. However, it remains that NBC can further and strengthen the worldwide cause for elephant welfare. Public education about elephants and issues of elephant survival are not mutually exclusive. I know that many of your viewers would be highly enthusiastic to learn about elephants in their natural habitats and the factors affecting their daily lives. Please consider this very sincere request. Thank you.